we have a large enough meeting room which can accommodate all types of Conferencing and Functions. 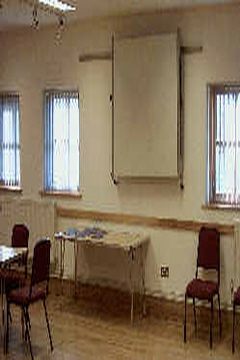 It is currently used by art groups, as an early morning soup kitchen, a meeting room for local and corporate events, and is also used by the Scout & Guide associations. 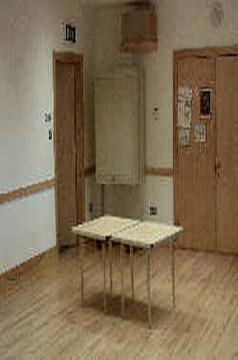 It measures 30 ft by 20ft (approx), with kitchen and toilets(with Disable facilities)adjoining the room. The room can accommodate conferences, up to about 30 people. Included in the room hire are a TV/Video in a cabinet, projector screen, white board, and flip chart stand. (flip chart can be provided at an extra cost). The room can be laid out in a variety of styles, to suite your conference or function or it can be left for the event organiser to lay it out in their specific style. The room is fitted with a spot light bar easily controllable. Refreshments can be laid out in the meeting room, to be used on a self help basis, or provided at set times. The seating is cushioned for that extra bit of comfort for the longer meetings. The Car Park can accomodate about 12 vehicles (more if they are doubled parked). It is secure and can be locked if required. More parking is available on Brynglas Road. If you have an interest in conferencing or room hire, please contact us by E-mail, we will respond to your request as soon as we can, and your request will be passed on for processing.